Dream Big featured civil engineer Menzer Pehlivan works with girls from St. Theresa School – from left, Isabelle Mascarenhas, Emily Frost, and Breda Brosey. 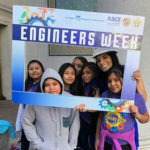 Every February, engineers worldwide seize on Engineers Week to engage with grade-school students and help them envision careers in the profession. This year has provided even more reason for excitement with the foundation DiscoverE’s official 2017 theme, Engineers Dream Big, linked to the release of ASCE’s inspiring, giant-screen movie Dream Big: Engineering Our World. ASCE is co-chair of 2017 Engineers Week. Society members jumped into Engineers Week 2017 activities across the country. 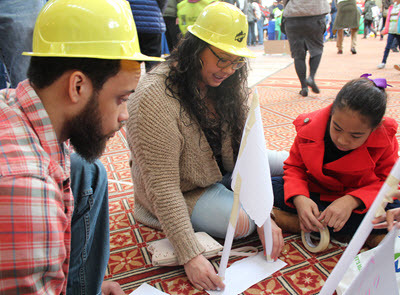 National Capital Section members came out in full force to help kick off the week Feb. 18 at DiscoverE’s Engineering Family Day, held at the National Building Museum in Washington, DC. Davian Booker shows off the tower he designed and constructed at Engineering Family Day. “Studies have shown that talking to children as they get into the middle-school ages, when they’re making those decisions about what they want to do in college and their life, and exposing them to engineering this young gets them thinking about it early and helps encourage them to pursue it later on,” said Emily Dean, P.E., M.ASCE, Section treasurer and an ASCE organizer for Family Day the last eight years. 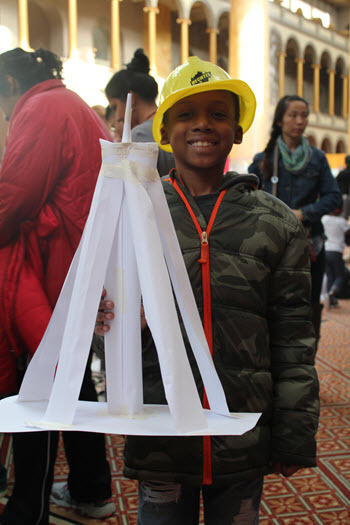 Section members, aided by volunteers from Bechtel, helped children work on an activity featured in Dream Big, the Windy City Tower, in which the young engineer must design and build a tower out of paper that can resist the wind power of a box fan. From the looks of it, the children loved the challenge. 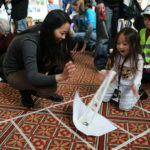 Brian, Rachel, and Leilani work on the Windy City Tower activity at Engineering Family Day. 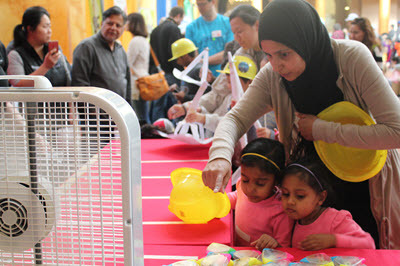 Meanwhile across the Building Museum, families viewed educational Dream Big web videos and had the chance to talk with some of the engineers featured in the film. Tyler Welsh, one of the Bridges 2 Prosperity engineers in a memorable sequence on building a bridge in Haiti, came to Family Day to talk about his civil engineering experiences. 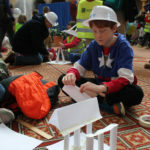 Another of the featured civil engineers in Dream Big, Menzer Pehlivan, P.E., M.ASCE, was in demand at a variety of events around Washington – in addition to Family Day, she attended the Future City finals, and headlined a special screening of Dream Big on Introduce a Girl to Engineering Day. The moment of truth for the Windy City Tower activity arrives when the girls test their structures against the box fan. Together with ASCE 2017 President Norma Jean Mattei, Ph.D., P.E., F.SEI, F.ASCE, Pehlivan conducted a question-and-answer session with a group of elementary-age girls after the movie, at the Smithsonian National Air and Space Museum’s Udvar-Hazy Center in Chantilly, VA.
“I was actually really inspired by it,” said Emily Frost, a sixth-grade student at St. Theresa School in Ashburn, VA. “I thought I would have to do all kinds of math stuff, but now I know it’s more than math and science.